Artist Sandra Merwin donates to AireCanada! Well-known Montana artist, Sandra Merwin, is currently working on lovely little drawings based on photos from those provided by her Facebook friends. Each day she draws a different name and sketches a dog owned by that individual. These unique little drawings are for sale with proceeds all this week being donated to AireCanada! We thank Sandra very sincerely for her generosity! AireCanada appreciates this unexpected support enormously! AireCanada has not mounted a general fundraiser since 2009. As a result, the treasury is becoming depleted. 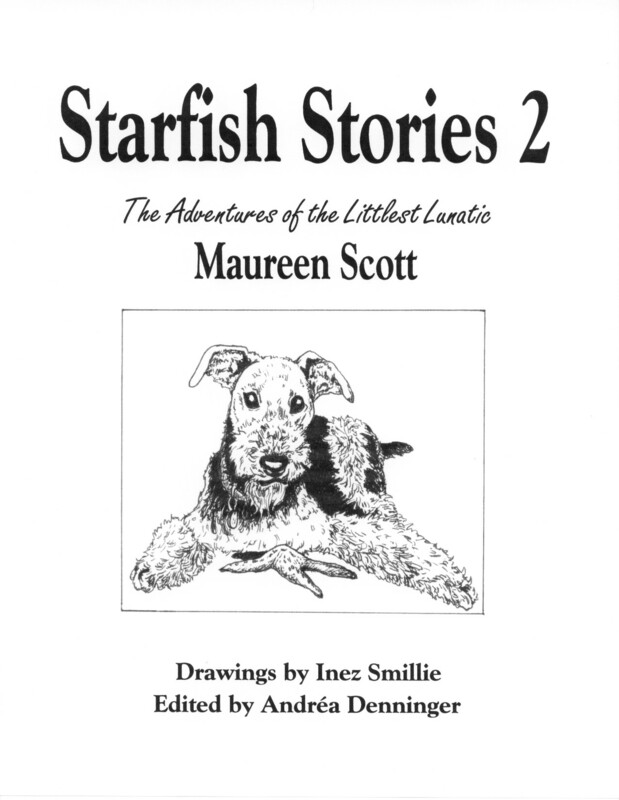 In an attempt to restore funding to a more acceptable level, AireCanada is offering copies of a booklet called the Starfish Stories 2 in return for a donation to help our rescued Airedales. AireCanada has rescued and rehomed many “starfish” over the years. 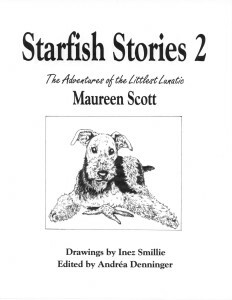 The Starfish Stories 2 is an anecdotal account of a little blind rescued Airedale initially named Courtenay who, as a result of her very silly behaviors, became known as the Littlest Lunatic. LL’s misadventures will have you howling with laughter. This 68 page booklet, illustrated with photographs and original drawings, is available for the very nominal amount of $15 in Canada or $20 in the US. Shipping is included. A limited number of overseas (ie. not in North America) customers may currently acquire this book for $15 because shipping for the first 14 overseas customers will be provided free, thanks to a generous donor. Payment may be made through PayPal (username: mmscott@telus.net) or by cheque payable to Maureen Scott. Mail cheques to Maureen Scott, 1025 Ogden St. Coquitlam, BC V3C 3V8 Canada. Please indicate that your cheque is for a copy or copies of the Starfish Stories and include your shipping address. Thank you for supporting AireCanada! Raku Jewelry for Sale! Great Christmas Gift! Please note that Paypal payments to < payments @ airecanada.com > cannot be accepted at this time. For Canadian and US customers, cheques payable to “AireCanada Rescue” are very welcome. Overseas customers should contact britishcolumbia@airecanada.com for information regarding a Paypal address that can be used to purchase this jewelry.